Fall is the best transitional season. With the weather gradually cooling down, leaves start changing colors, sweaters and hoodies are worn by all, and cozy hot chocolates are a must. Fall also means that we’re gradually getting closer to the most wonderful time of the year, Christmas!!! In Canada, we are lucky enough to witness all four seasons, which all have their own perks. Each season marks the beginning of a transition throughout the year. Summer is associated with going on vacation, autumn and Halloween go hand in hand, Christmas and the first snowfall are winters main events and lastly spring is the revival of life. Fall fashion means coats, sweaters and booties. I love dressing up this time of year since it involves cozier and comfier pieces. The colder weather also allows me to layer with different items, such as turtlenecks and jackets. Sweaters are by far my favorite clothing item since I LOVE to bundle up in them this time of year. In today’s post, Ill be showing you 4 eclectic outfits inspired by the cold weather. The first outfit is minimalistic, but still fall appropriate. Black is classic and timeless color that is versatile and appropriate anytime of year. You can dress up any black outfit by accessorizing or leave it plain for a more clean and simple look. My booties are from the brand wishbone and I got them last year. During the fall, a staple black booty is a must since it can dress up any outfit and is re-wearable for the years to come. My black pants and grey hoodie are both from Zara. If you’re in need of basic pieces that you can layer together, I highly recommend Zara since they carry on trend fashion at a reasonable price. My puffer coat is from the North Face and if you do not live in a region were the winters are blow zero, then you might not know that these coats are made for extreme winter conditions (such as the minus thirty weather we get in Canada). To make the look a little less dull, I wore a berry lip color and tied my hair in a low bun. The second outfit’s main color focus is pink and the addition of the faux-leather jacket makes the look girly, yet egdy at the same time. During the fall, I love dressing up any casually and simple outfit by adding a statement piece, such as an edgy coat or chunky boots. The biker jacket I’m wearing is from Topshop and this type of biker style coat has been all the rage the past year. The pink fuzzy lining on the inside of the coat adds a certain je ne sais quoi and makes you feel like a total girl boss. 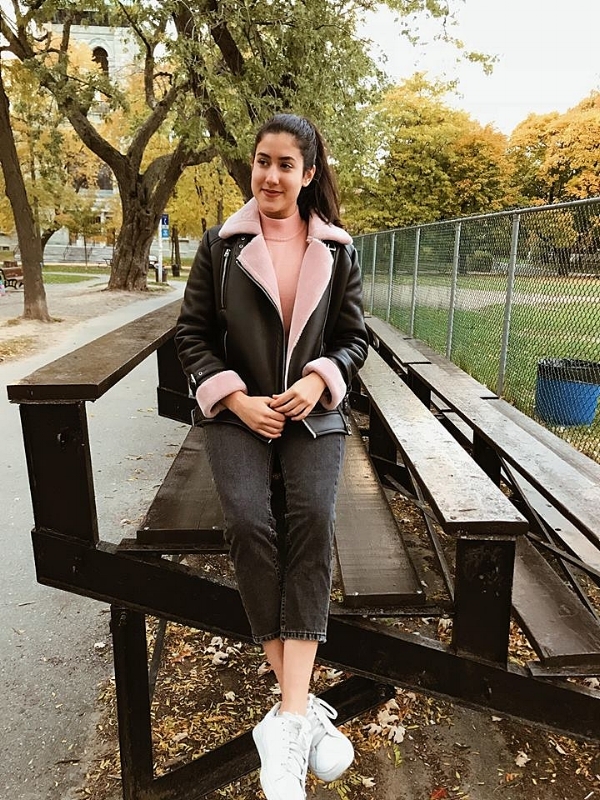 The pink turtleneck I’m wearing underneath is from a thrift store and was under ten dollars! If you are on the market for trendy and vintage looking sweaters that are affordable, I would highly recommend hitting up your nearest thrift shop. The jeans I’m wearing are these high waisted, slightly acid wash jeans from Zara. My shoes are the comfiest sneakers I own and they are from Fila (got them from Costco ;). Plad is so rad during the fall. These funky pants are from Urban Outfitters (the sales section) and are the comfiest pants ever! They are extremely high waisted and slightly flare out at the end which definitely gives off a 70’s vibes . The sweater I’m wearing is thrifted and my oversized denim jacket that I wear 24/7 is also thrifted. Also, I added a thick brown belt to the pants, but my sweater is sadly covering it. Lastly, my platform sneakers which also have a retro feel to them are from Zara. Retro fashion is fierce, quirky and fun and I love anything that makes me reminisce on the past! My last outfit is definitely the laziest and comfiest out of all of them. My leggings are from Lulus and have been my ride-or -die leggings for years. They are expensive for a simple black pair of leggings, but if you’re in the market for some high quality leggings or are simple an athlete, it’s definitly worth investing in a pair since they last forever and are extremely comfortable. My booties are from Browns and I decided to wear blue socks over my leggings so they could match with the denim jacket. I wore this fuzzy faux- shearling sweater underneath to keep me warm (the color also matches the booties hehe). The pink beanie is from Urban and is designed by the brand Stussy. Playing around with fashion is something I try to do all year round. However, fall and winter hold a special place in my heart since fashion during these periods is all about comfort and layering. Most importantly, fashion is a way to express yourself. Therefore, wear what you makes you feel like you can conquer the world, that is the power of clothing. Keep evolving, and stay true to your own unique style.